Home > COMET INDUSTRIES BELTS > COMET 203596A BELT REPLACES 994-105 Comet 30 Series > Comet 215699A "Green" Torq-a-Verter2, 30 Series Spring. Manco 6805. > Comet 203189A, Jam Nut for TAV2 5/8" Shafts > Comet 215558A: 2-Pack TAV2 BEARING Kit for Comet Industries Torque-A-Verter. Comet 215558A: 2-Pack for Comet Industries Torque-A-Verter Kit. Comet "Heavy Duty” Bearing kit 215558A. 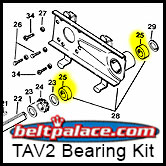 Comet TAV-2 Replacement Bearings, Part: 215558-A. Replaces: Manco 5090. Manco Part# 5090. For use with Comet TAV2 Series Centrifugal Clutch drive systems. 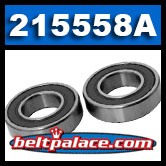 Genuine Comet 215558A Bearing Kit (Heavy Duty) for use with Comet Industries TAV2 Systems. Made in USA by Comet Industries.